A few weeks back, I asked you all if there was something that y’all wanted to see on Southern Bite. I was flooded with responses, which was incredible. One request was for Swiss Steak. It was something I hadn’t thought about in years. I remembered eating it as a child, but couldn’t remember the last time I had had it. Nonetheless, I knew it had to be one of the next things to bring to y’all on the blog. So fast forward to last Tuesday night. We’re all sitting around the table eating our Swiss Steak – me, Heather, Jack and Laura – when someone asks, “Why is this called Swiss Steak?” And you know, I had no idea. Well, thanks to a little research (I love you Google), I found that Swiss Steak actually has no relationship to Switzerland. In fact, it’s called Swiss Steak because of the way it is prepared. Apparently “swissing” refers to pounding or passing something through rollers in order to soften it. I used cubed steak in my version of Swiss Steak because it’s super-cheap and has already been “swissed” by the butcher. I just know you’re going to love this easy recipe. And while I’ll admit to cooking time doesn’t make it a quick weeknight supper, it’s really worth it. One thought I’ve had, and maybe one of y’all will give it a try and report back to us, is to brown the meat then toss it and all the other ingredients in the slow cooker. I’m pretty sure it would turn out delish! 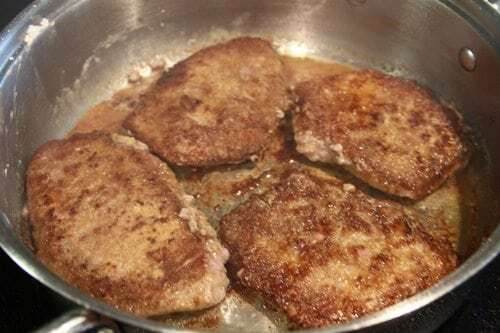 Lightly season cubed steak with seasoned salt and dredge in flour. Brown in 3 tablespoons of vegetable oil. 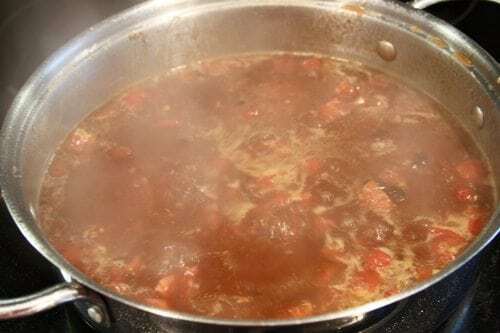 Remove steak from pan and add two cups of beef broth, packet of brown gravy mix, and can of diced tomatoes. Stir well, scraping the bottom of the pan. Bring mixture to boil, reduce heat, and return meat to pan. Simmer covered for 1 to 1 1/2 hours or until meat is fork tender. Bring mixture to boil, reduce heat, and return meat to pan. Simmer for 1 to 1 1/2 hours or until meat if fork tender. I make this regularly in my slow cooker and it is so good. I use 1 can of beef broth and a cup of diet cola and add strips of bell pepper and rings of sauteed onion…we call it creole swiss steak. How long do you cook it in the slow cooker? And do you just brown the steaks and then dump everything in the cooker? Thanks! I’ve made it in the crockpot before, hubby didnt care for it, but let me tell you, it made the best soup lol, added more veggies and cut up the meat and all that great broth with the tomatoes, peppers and onions..yum! Look how resourceful you are!! 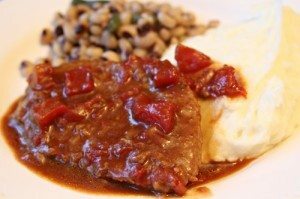 I have been making Swiss Steak for years and years and never knew the origin of the name. Thanks for taking the time to research. I use round steak that hasn’t been “swissed” yet. Cube steak is a good idea and should speed up the cook time. Thanks, Stacey! I know, I was kinda surprised myself. You just never know! I use round steak cut up in serving pieces. Dust it with flour, brown in some vegetable oil, season with Lawry’s seasoned salt, pepper and garlic powder; pour off the grease then add some water so it comes to the top of the meat. Add an onion that’s been cut in thin wedges and 2 beef bouillon cubes. Let it simmer until the meat is tender, about an hour or so. Sometimes I add sliced fresh mushrooms right at the end. Also, sometimes I’ll add 2 cans of stewed tomatoes with some water, instead of the water, bouillon cubes and mushrooms. Either way it is so good; serve it with steamed rice. Thanks for sharing your recipe, Betty! Featured this on my page for our readers. Looks yummy and I also remember my Mom fixing this for us kids. Haven’t fixed it in years, and years. Thanks for a great recipe! Thanks for sharing! So glad I was able to bring back some memories for you! I love how food can do that! This is not Swiss Steak, I’m sorry but “real” Swiss Steak uses the same kind of meat or you can pound round steak and do it that way. You take green pepper, chopped tomato, chopped onions, garlic,salt , pepper, and saute till soft. Dredge your meat in flour, brown both sides add to sauteed veggies, cover and simmer till done. Serve with real mashed taters, maybe some nice cole slaw and you’ve got a great meal. I’m with you. I’ve never had it with beef broth and gravy added to it. My dad always made it with canned stewed tomatoes but going to try your suggestion and making mine from fresh veggies instead of canned. I happened across your page looking for a crock pot chicken and dumplings recipie. (I’m cooking yours right now :)) I was scrolling through the comments below the recipie and found a link to this. It looks amazing. I’ve never had Swiss steak, but I can’t wait to try this out. Thank you!! Welcome, Sarah! I hope everything turned out great for you! Two thumbs up! I’d never made this before. I used round steak which I tenderized. Thanks for this awesome recipe! Wonderful, Ginger! I’m so glad it turned out well for you!!! 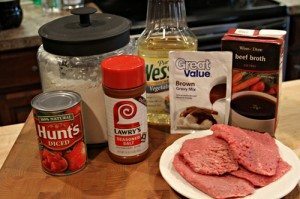 I had never ever heard of Swiss Steak until seeing this! Made it last night and it was delicious!!!! Wonderful! I’m so glad you enjoyed it!! I make Swiss steak like my mom taught me. Brown cube steak , put the meat in a 9 x13 baking pan. Cut up onions, celery, peppers and carrots and put over the meat, than pour a large can of tomato sauce over the contents of baking pan . Cover pan with aluminal foil and bake in slow oven 325 for an hour to hour and half.. Serve with rice pour that great tomato gravey over everything. YUM! 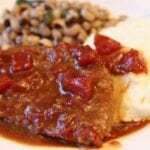 My Swiss steak recipe is made in the oven, over rice. You take the steak whatever kind you can get, brown it in a skillet with bacon grease, into a 9×13 baking pan put a cup of uncooked rice, add the steak pieces into the pan, pour over tomatoes or tomato juice, or V-8 juice slice some onions on top, peppers if you have them, and put into a 350F oven for at least 2 hours three is better. I got this from a 1940’s ladies auxiliary cookbook my MIL had, never said nothing about tenderizing! It comes out tender enough to cut with a fork! 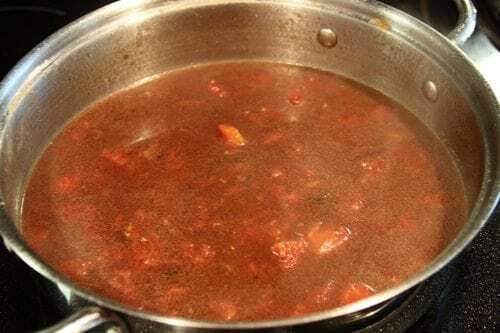 Tomato juice works well, or any tomato based juice, the diced tomatoes are not juicy enough to cook the rice well, so I just add V-8 to make the dish soupy, and by then end of the cooking time, its all absorbed and the rice is yummy. I just bought some cube steak on sale! I always make my Swiss steak with eye of round, or similar cuts, but I don’t pound it (tenderize it), and no matter how much liquid I use, it always seems dry. I’m going to try this recipe with the cubed steaks, except I’ll use stewed tomatoes because I like the green pepper taste it has. I’ll bet it won’t be dry with the cube steaks. Thanks, Stacey! 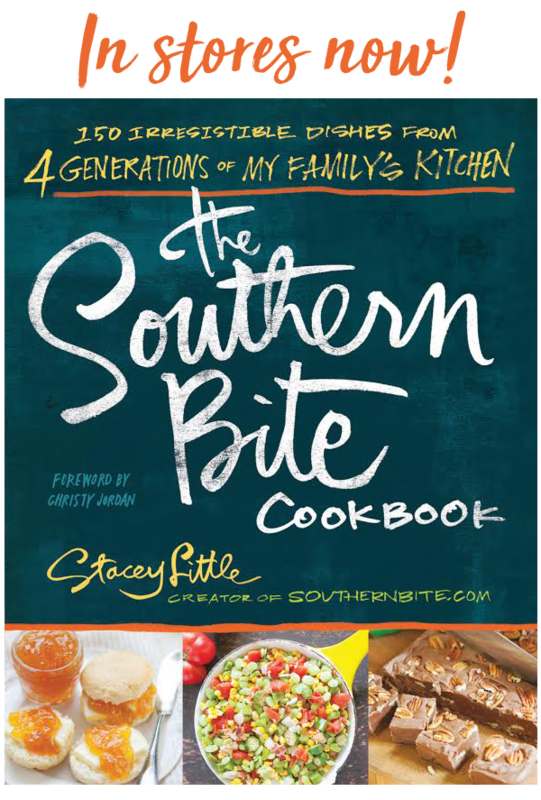 Thank you for these yummy recipes! I’m so glad I registered to receive your emails with the delectable choices. 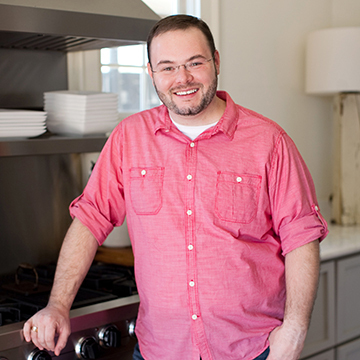 Anxiously looking forward to the next email so I can expand my recipe selection. Thanks, Kay! There’s plenty more on the way! My Mother made this when we were growing up. We were poor “Country Folks” so she used ground beef patties. It was delicious. This would work for a family on a budget and would probably cut the cooking time in half. This dish is an oldie but goodie for sure !!! My mother taught me when I was young to cook this and is still one of my favorite recipes. Your version is similiar. However, if you happen to be out of tomatoes, you may consider this version of mine. I first take the chill off the meat and marinade with 3tbls of worsterchire sauce and 2 tbls of low sodium soy sauce, for about 20 mins. Then slightly pat dry with a paper towel and coat with Seasoned flour. (I use salt free Tony’s Chacherie’s and a little salt to it.) Brown in 3tbls of oil and 1tbls of butter. Then remove the meat to a plate. I add 1-2 tbls of apple cider vinegar to deglaze the skillet and add sliced red bellpepper and sliced onion and saute to caramelize the onion just a bit, then add 1-2 minced cloves of garlic and saute a minute or two. Then I add chopped fresh parsley, i can of beef stock or broth and a can of water. Bring to a boil and add meat and simmer for 1-1/12 hours with the lid removed on the last 30 minutes. Served with creamed red potatoes. Nothing like a home cooked meal !!! I’ve made this using my Mom’s recipe for years! The only difference, is I saute an onion along with the steak, and add 1 tsp. of thyme. Yum.